We try so hard to make it in the world. to prove to the world and to ourselves that we are good enough, strong enough, smart enough and so many other things, too. 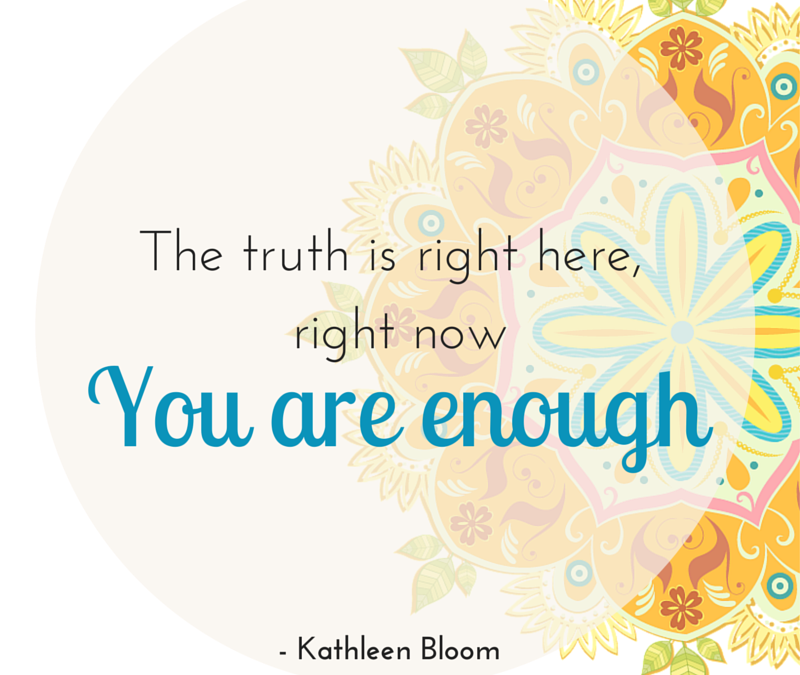 The truth is, right here, right now: You Are Enough. In this moment, even without accomplishments, successes or proof – you are whole, complete, enough as you are. We can get caught up in the whirlwind and expectations of our careers, relationships and family. It is easy to fall into the trap of comparison and judge ourselves and measure ourselves continuously. You can get out of that by seeing yourself as simply and wonderfully enough right now. Here are a few tips to consider as you let go of the proving yourself to the world (and yourself) and see the truth about who you are. Having success in your field or endeavor is wonderful – but it does not have to define you. Live your life with an open mind, extend compassion to yourself and others and stay in the present moment. This will support you as you recognize the truth that who you are is not what you do. When you the time comes of getting wrapped up in what the world thinks of you and feeling you “should” do more or be more, take a few minutes to write up a quick gratitude list. It is easy to do – counting your blessings is always in order. When things a going great, remember to have gratitude. When things are going not so great, or even down right wretched, remember to have gratitude. It is a good way to get back into the present moment and see the beauty of your life and yourself. Service to others is a way to move the focus off yourself and your condition. It allows you to get out of yourself and share the goodness of your life force with the world. Be careful that being of service does not become a new way to define yourself, just do it to help others. Want to know a super easy example? Next time you are out and about, hold the door open for the person behind you. It is such a small thing and people really appreciate it! There are a hundred small ways that you can be of service to people in a day. These help you to get out of comparison, measurement and judgement. Now its YOUR turn: Think about how you free yourself from feeling like you have to do more or be more? What acts of kindness and service do you love to do to help others? What are you grateful for right now?